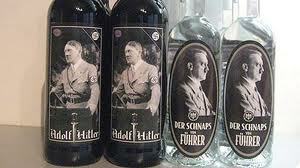 Officials say they have stopped investigating a man after finding no evidence that his sales of wine and schnapps with Adolf Hitler on the label were breaking a law against glorifying the Nazi era. State prosecution official Heinz Rusch says the investigation has ended because of lack of proof the man broke that law. The man was identified only as Roland M., in keeping with Austrian privacy laws. Legal officials say he was motivated by profit, not ideology.